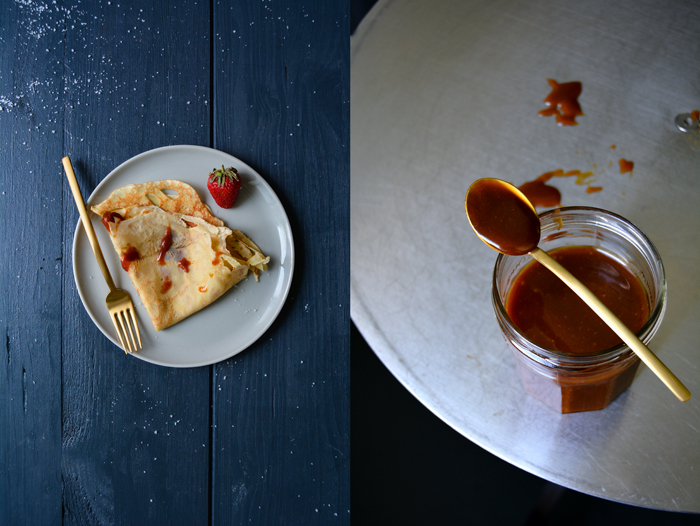 An unexpected change of plans led to the most delicious French breakfast: thin crêpes with salted butter caramel! And the only reason why we could enjoy this treat was because I failed miserably at another recipe, a complete kitchen failure. 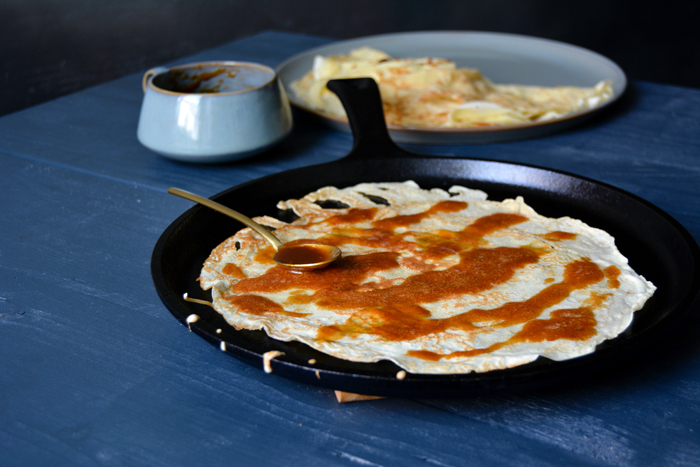 I tried to remake the popular galettes caramel au beurre salé from the Mont Staint Michel region in Normandy which I indulge in with the greatest pleasure whenever I can get hold of them. It’s a simple shortcrust cookie with a buttery hint of salted caramel. I didn’t expect it to be such a big deal, I had a clear idea of the texture, I did some research of course and then I got started. My kitchen activities began with the preparation of the crème caramel au beurre salé, a thick and luscious salted caramel cream which turned out really nice. At that point, I was still absolutely happy with the result and I continued mixing the dough for the cookies with great confidence but it went downhill from there! When I took the galettes out of the oven I had to face the disappointing truth, my adaptation of the delicate French caramel cookie was too thick and not crunchy and crisp at all. Although the butter caramel was only supposed to be mixed into the dough, I tried to save my creation by topping the baked cookies with a generous dollop of my tasty crème caramel but it was hopeless. I gave up, which doesn’t happen very often. To overcome my culinary disappointment, I took the caramel filled jar out of the fridge and enjoyed a spoonful of it to make amends for the complete disaster. 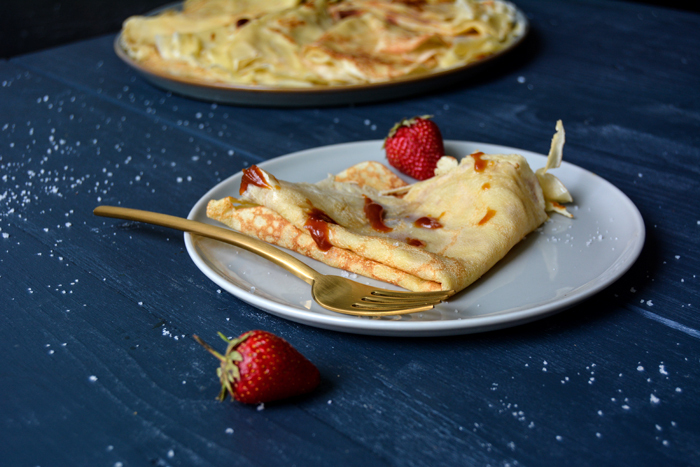 It helped right away, my inspiration came back and reminded me of another French classic, thin breakfast crêpes would be perfect with my delicious caramel. It was so good that I almost forgot about my unpleasant incident, we savoured and emptied the plates down to the last crêpe. I haven’t completely given up on my French caramel cookies but I think I could do with some help: if you are experienced in the cuisine de la Normandie and familiar with galettes caramel au beurre salé and if you know about a satisfying recipe, I’d be more than thankful if you got in touch to bring this kitchen story to a successful ending! And some more news at the end: I was interviewed by Yahoo Food, they asked me to take over their Instagram this weekend to share a little forecast of the delicious food I’ll be eating in Malta next month. For the interview, click here, and here you can follow me on Yahoo Food’s Instagram. You won’t need all the caramel for the crêpes, you can keep the leftovers in a jar in the fridge and use it for ice cream and cakes. In a sauce pan, warm up the cream, take it off the heat before it starts boiling. In a medium sized pot, melt the sugar on medium heat until golden brown and liquid, it will take a few minutes. Mind that it doesn’t burn. Slowly pour the warm cream into the caramel, be careful as it will bubble up and rise. Keep the heat on medium, add the butter and salt and and whisk gently until the caramel and butter melt and the mixture is even, it will take a few minutes again. Take the pan off the heat, season with salt to taste and set aside. 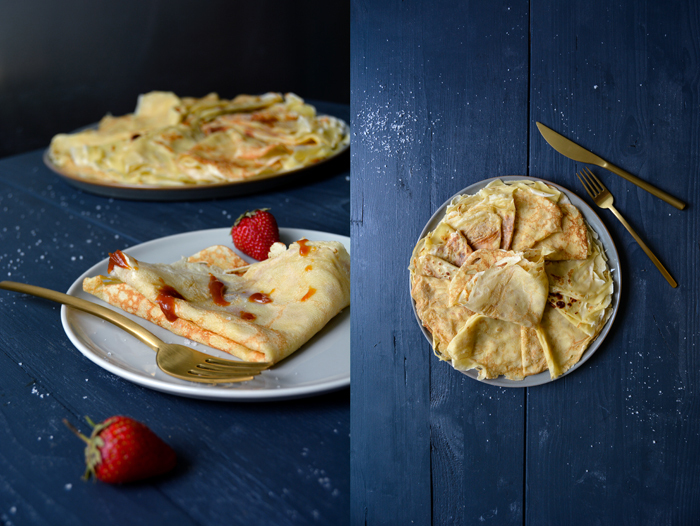 Mix the ingredients for the crêpes to a smooth dough (with an electric mixer) and let the batter sit for 10 minutes. In a heavy (or non-stick) pan, heat half a teaspoon of butter. 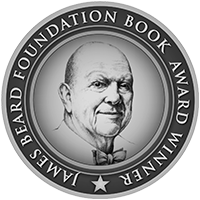 Pour in a ladle of the dough, holding the pan in your hand and turning it so that the dough spreads evenly and very thinly. 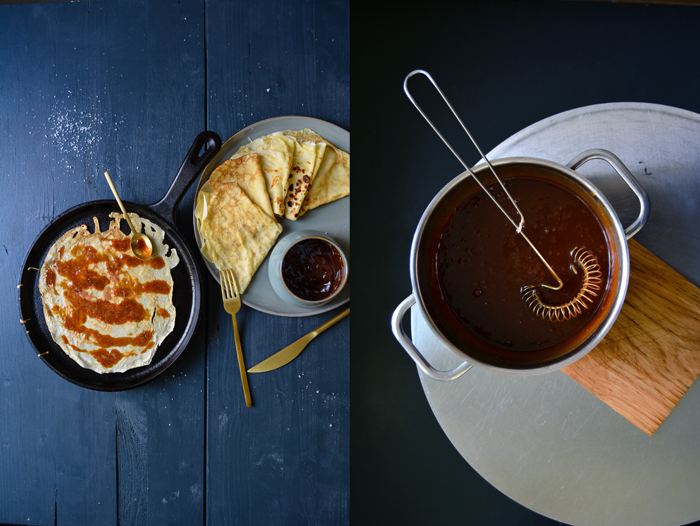 The temperature should be on medium-high, the crêpes won’t need more than 1 minute on each side once the heat is set right. 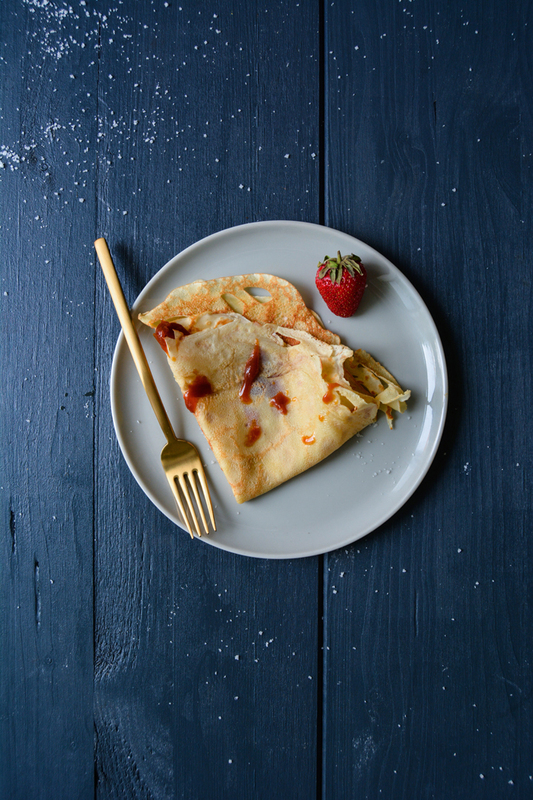 When the crêpe is slightly golden on both sides, take the pan off the heat (or spread the crêpe on a large plate) and sprinkle with a little of the caramel. The taste is quite strong, so start with 1/2 teaspoon and add more to taste. Fold it twice and continue with the next batch. 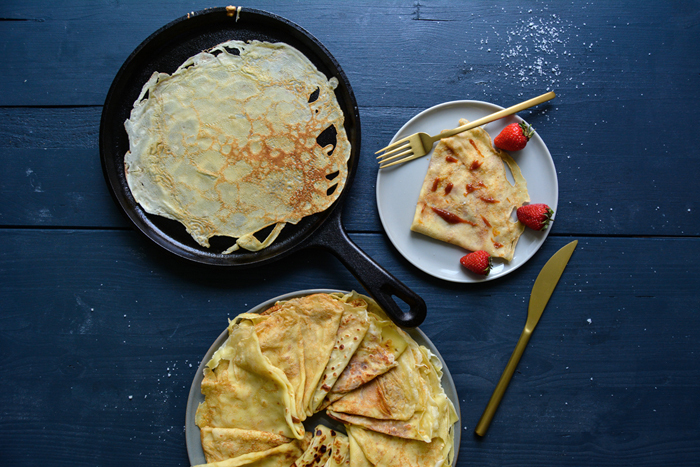 You should always melt 1/2 -1 teaspoon of butter in the pan before you fry the next crêpe. 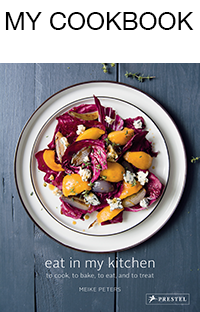 Enjoy warm and sprinkle with more caramel and a pinch of fleur de sel on the plates. Strawberries go very well with it!